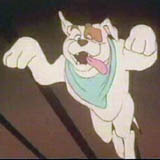 Duke the Dog was voiced by Tomm Wright. This dog, whose only weapon was his bark and bite, was very loyal to Kevin - both a weakness and a strength depending on how you look at it. Duke will do anything to protect Kevin but is actually slightly cowardly. He loves to chase cats and at one time chases a cat straight into Bayouland, thus setting off a meeting with Bayou Billy, the main character of the game that Kevin could never beat.